Direct-to-consumer distribution channels are now life and annuities carriers’ primary focus. Boston, June 29, 2016 – While the U.S. life and annuities industry remains predominantly an agent-driven market in terms of written premium, carriers have been moving into other distribution channels over the past 20 to 30 years. 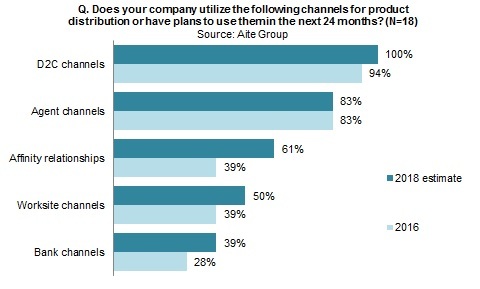 Differentiation within each channel isn’t a concern to carriers, however; the differentiation comes with the combination of channels used and the management of channel conflict. Understanding how the industry is shifting is essential as carriers test new distribution channels aimed at closing the gap in life insurance ownership. This report identifies the current state of distribution channels being used and improved to sell life insurance and annuities products. It is based on 18 Aite Group telephone and online surveys conducted in 2016 with senior-level executives at U.S. life insurance and annuities carriers. This report will give insights into the industry and allow carriers exploring their own distribution strategies to see how their peers are evolving their strategies in the coming years.